I have a new relationship in my life. I am in love with my current workout! Yep, you read that right. I have found a workout that I actually enjoy! 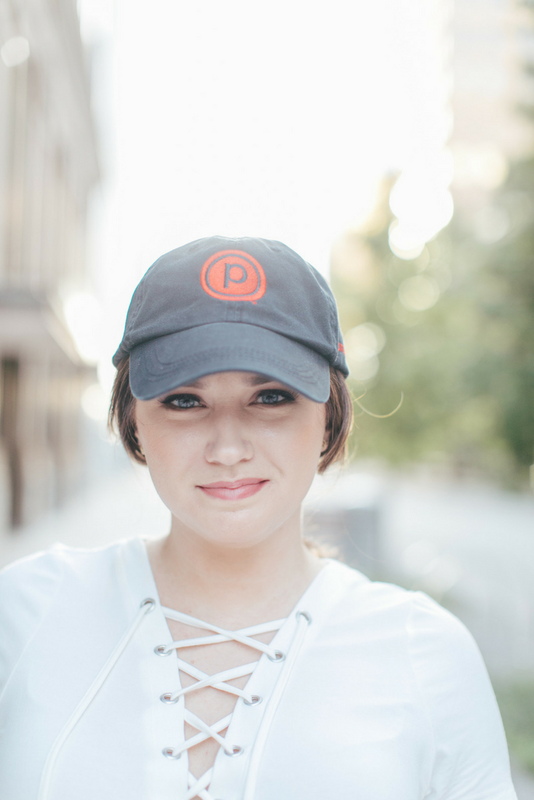 A few months ago, a Pure Barre studio opened within a five-mile radius from my home. They offer classes multiple times a day and seven days a week! Each class is different, so it keeps you entertained and your muscles stay engaged the entire time. You will come to love the small, targeted movements with big results. I feel like a million bucks after I finish my workout, even though I do not look like it. I am not one of those girls that look pretty after a workout. Nope, I look like I just took a dive into the pool with all of my clothes on. 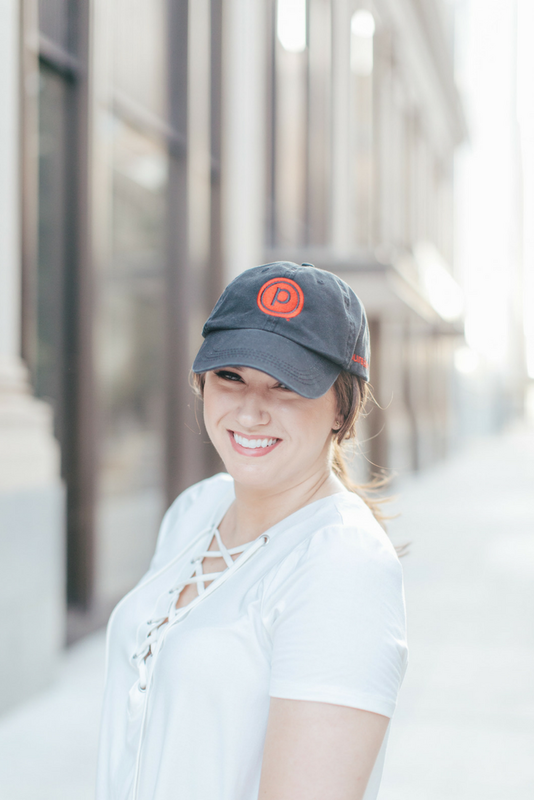 I have a few tricks up my sleeve to keep me looking fresh, and I want to share with you how I go from Pure Barre to running errands around town. The night before class, I make sure to have all of my ducks in a row. I lay out my workout gear, sticky socks, and flip-flops. I take my Packed Party pouch to class with me and I have it filled with my essentials. In there you can find my wallet, cell phone on silent (to be kind of course), one YUNI Beauty Shower Sheet, lipstick, and a clean tee to change into. After class, I grab everything out of my locker and freshen up. 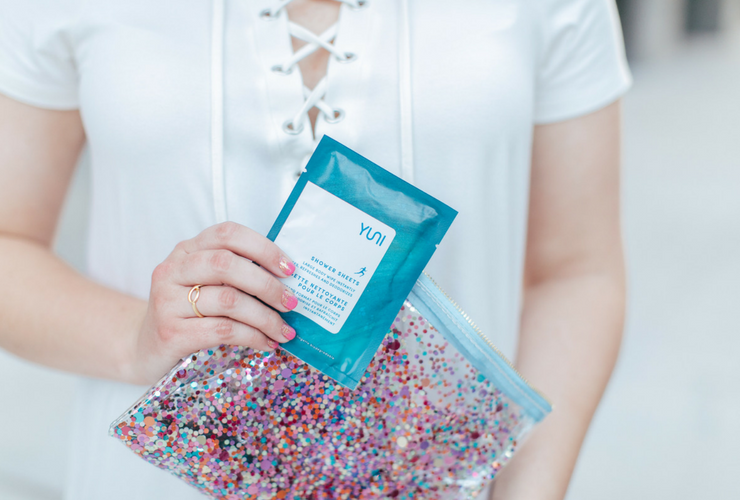 I am telling you, if you do not have time to shower, these YUNI sheets are magical and surprisingly big enough to do the job! After I have cooled down and removed the nasty sweat, I grab my clean shirt and toss on my baseball cap and call it good! Now I am ready to tackle my to-do list. Finding the right workout pant can be extremely challenging. I know that a lot of you out there like Lululemon. To be honest, I have not purchased any of their workout pants because I would rather spend my money on shoes or handbags. Maybe one day I will treat myself to a pair (never say never, right)? 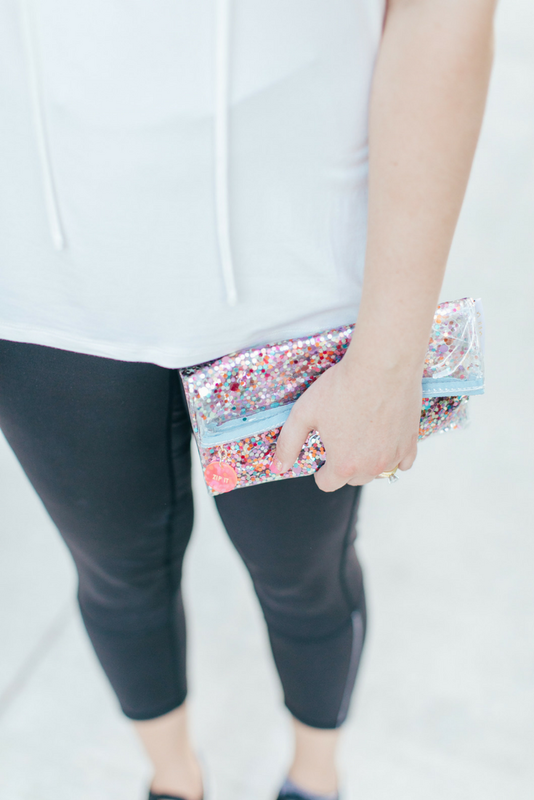 You might be surprised that my favorite workout pants are from Old Navy. The pants I am wearing here are from last year. However, I have found a very similar pair and come in four colors (including black). Trust me, they fit in all of the right places and make your booty feel fabulous! You all know I live for a good tee! 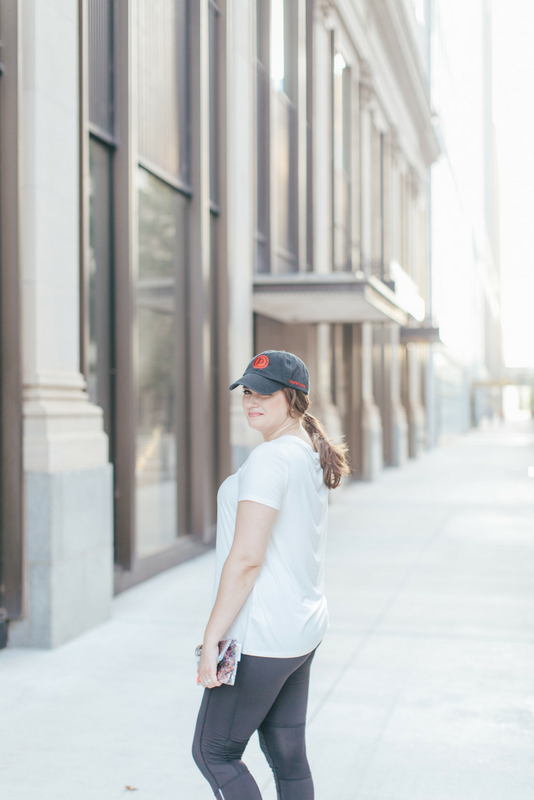 From the office to running errands, I believe there is a tee for every occasion. This Tobi number is trendy without breaking the bank! You will want to live in this once you feel it on your body. Imagine the softest stuffed animal you have ever cuddled and times that by ten. Get the idea? This tee is THAT good! I am all about the Old Navy yoga pants too. And I love everything you have been sharing from Tobi lately! I have had really good luck with my Old Navy workout gear. I must say, I am about to break down and purchase a pair from Beyond Yoga. And thank you, Tobi is so fun and trendy! I hope that you are doing well, love watching your insta stories.